Now how will Sony name the LT29i, which seems to be the international version of the Xperia GX, is still a mystery, but the handset has already received a preview, and now we have video hands-ons, and a 1080p camera capture sample. We should know the name for certain August 29, when the grand unveiling is expected. As a reminder, the phone sports a 4.6" HD display with the Mobile BRAVIA engine, and is powered by a 1.5GHz dual-core Snapdragon S4 processor, placing it up there with al the high-ends. Its main selling points are also the new 13MP backlit sensor with "stacked" design, and the thin 8.6mm body, which, together with the clean front with no physical buttons, make it easier to handle with one hand than the other flagships. The folks that handled it say this is a prototype that has been conceived and produced a while ago, hence the Sony Ericsson logo still, but they claim the final product will look the same, and ditch the prototype logo for the strictly "Sony" branding, as the other new Xperias. We wish the viewing angles of the screen were better, but let's not prejudge before we get the final unit for review. One thing is for sure, Sony is not good at keeping secrets, and we are enjoying every leak of it. yesssssss finally woottttt :D waiting the entire year skipped xperia s , ion , acro s!!! I didn't think it'd be this good. Wow. +1 for Sony for using onscreen buttons!! 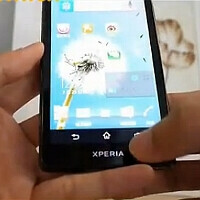 :D When Sony gets this good, who needs HTC? As long as it has 2 GB of RAM... just wow. lucky.. i only know cantonese! You are From hong kong ? I know Cantonese too . looks good,love the shape of the arc that they had in xperia arc 2. How the chinese get EVO 4G LTE when it is ONLY available in US.... FAKE!!! Hopefully, U.S. residents will be able to get a timely release in the States unlike the Ion. Hopefully AT&T can get this in their lineup, I'd sure be interested.